Today shortcake is usually made of biscuit or sponge-cake variety, but the first alike desserts called for pie crust or broken-up pieces. This kind of shortcake was popular even in the beginning of the 1900s, especially in the South. Today soft biscuit is commonly used. Although you may think that strawberry shortcake is an American invention, it actually belongs to the Brits. The first mention of the dish dates back to 1588, when it was printed in an English cookbook. 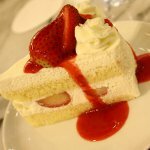 Strawberry shortcake was very popular by the 1850 and at that time it was layered with butter and sweetened cream. The French pastry chefs replaced butter and sweetened cream with heavy whipped cream only in 1910. Strawberry shortcakes became popular in the USA, during the times when summer fruit harvest was celebrated. Today summer fruit harvest is not held any more, but it evolved to National Strawberry Shortcake Day.